San Miguel de Allende has become the most important destination wedding venue in the center of México. Whoever has not visited this treasure in Guanajuato is missing a lot! The place is filled with art, history, good food, vineyards, handcrafts and very kind people. I met Betty and Adalid because we have mutual friends who were previously my clients. We first met in Mexico City and talked about their vision for the wedding and established our first connection. 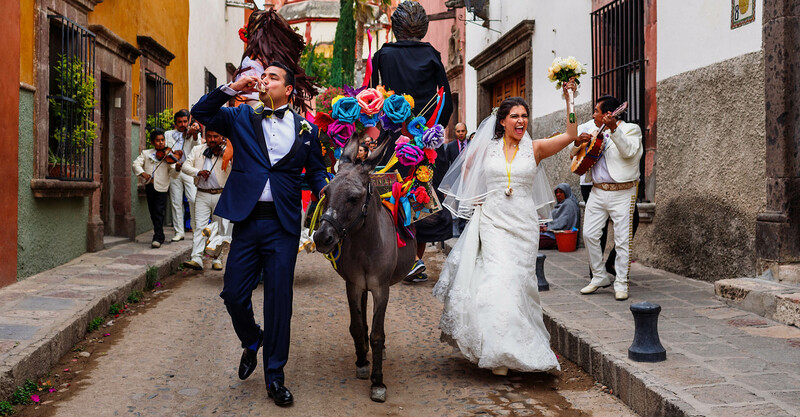 Betty and Adalid wanted to have their civil ceremony in San Miguel the day before the religious ceremony, which was an awesome idea which allowed their wedding guests to be part of every moment of their wedding. On the day of the religious ceremony, the arrangement of both took place at Hotel Nena, an intimate hotel boutique with 6 rooms, something that allows to have your closest guests close to you but avoids a crowded environment. Something that Betty and Adalid did and that I suggest every couple is to have a detailed schedule of times and locations for the day of your wedding. This facilitates the tasks of all your vendors, particularly of your wedding photographer. Spend the time necessary to create a detailed itinerary that reflects what you are looking for during that day. The religious ceremony took place in the Parroquia of San Miguel Arcangel. We returned to the hotel with a fun callejoneada, all organized by Hotel Nena. Once arrived, we enjoyed the party until very late at night. Betty and Adalid are two incredible individuals who have become my friends. It was a pleasure for me to share this special weekend with them. I wish you a long life together and happiness! Tell me more about your wedding!